You’ve probably heard about crash test ratings. They are posted on cars’ windows at the dealership and can help influence your decision when deciding which car to buy. But do you really know what a crash test is actually testing? Of course, it is testing how your car will perform in a crash, but there is much more to the equation. Crash testing is performed by the Insurance Institute of Highway Safety, a nonprofit organization with the sole purpose of reducing loss on the roadway. They perform crash tests on every car before it hits the market. The crash test consists of five different tests that give the car five different ratings. When performed, each test receives a score (good, acceptable, marginal, poor) based on how well the car responded and the injuries the test dummy received. 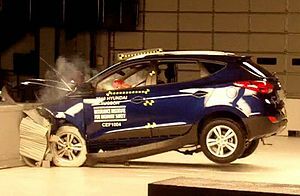 The first test is used to determine how well the car will perform in an accident in which the front of the car is crushed. In this test, the car travels at 40 mph towards a 2-foot tall barrier that sticks out in front of the car to cover 40% of its width. This simulation models a head-on collision and is performed with a dummy the size of an average male. This test was introduced in 2012 and is used to determine what would happen if the corner of the car was struck, either by another car or a stationary object. The car travels at a speed of 40 mph towards a 5-foot tall barrier that covers 25% of the width of the car. This test also uses the male-size dummy. The side-impact test uses a SUV-sized model that plows into the side of the vehicle at 31 mph. For this test, smaller dummies are used since small women and children are more likely to get injured in this type of crash. A small dummy is placed in the driver’s seat and rear seat closest to the crash. The main feature tested in the rollover test is the roof. In this test, a strong metal plate is pushed against the side of the roof at a consistent speed. They are measuring how much force it takes for the roof to reach five inches of crush. The roof must be able to withstand a force of four times the weight of the vehicle to earn a good rating. Finally, the ability of the car to handle a rear collision is tested. The main injury being tested for in this simulation is the amount of whiplash the passenger gets. Since headrests are the main component in preventing whiplash, this test measures where the headrest hits an average-size male. As you can see, there are many factors that determine the overall crash rating of a vehicle. How well does your car rate (check here to find out)? What are your chances of survival in a major collision? To help prevent a collision, make sure to drive defensively at all times (see DefensiveDriving.com to learn more).